The way to keep your garage door functional for as long as it can is to have it maintained by professionals. This will help you avoid a wide range of problems, and to keep from having to spend money on preventable repairs. The service appointments our team offers are bound to make a significant positive effect on the performance and longevity of your system. 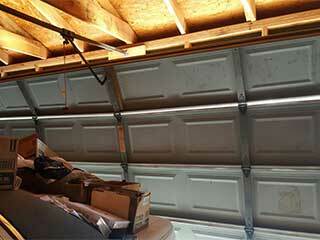 Most modern residential garage doors have a sectional design. They consist of a set of panels attached together rather than of a single large unit. Our job is to ensure that each of these pieces is in perfect condition. An inspection will show if there is any specific damage to the panels. Count on us to remove rust from steel doors as soon as we find it. If you have wood panels and they've begun to decay, we will remove the rotten wood, fill the holes and add sealant to eliminate the damage and prevent recurrence. If panel replacement is necessary, we can help you find new sections from the door's original manufacturer, and then set them up so that the curb appeal of your home won't be affected. All the moving metal parts of your garage door need to be lubricated. This helps to reduce the rate of wearing, improve their performance and to extend their useful life. As part of our maintenance service, we will use lubricant approved by the door’s manufacturer to ensure that every appropriate component, from the torsion springs to the steel rollers and hinges, is lubricated and able to work as silently and efficiently as possible. The opener's drive gear can also benefit from this, if it is made of metal, that is, as can the areas where the trolley gets into contact with the rail. If you have a chain drive system or a screw-based one, then they too will be treated similarly. Another thing we will do during our regular maintenance appointments is to test the safety sensors that the opener uses to detect obstacles. The alignment of these photo-electric eyes must be precise, as otherwise they may fail to work properly and the door could end up hurting someone, or it may start reversing each time you try to close it. To make sure your system is in the best possible shape, contact our team at Garage Door Repair San Ramon and let our technicians ensure that every one of its parts is in great working condition.